Hey everyone!!! Way to go we have 36 people participating!!! This is going to be great for everyone! All Santas have successfully been assigned! Make a fake Santa account and reach out to your target to get to know them! Most of all Merry Christmas season! Make this memorable for someone special! Welcome to the gift exchange. We at the Brawling Brothers strongly believe that our close knit community has grown significantly and we feel it is time to grow even closer by bringing our first Christmas Exchange to you the guild members and listeners. We want to provide a place for the members to find some extra Christmas cheer this year and really emphasize our belief that it is always best to lead by giving. 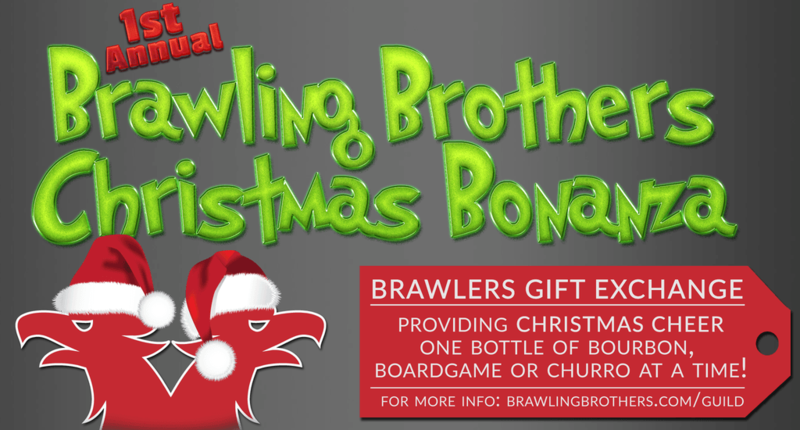 Replying to this thread does not sign you up for The Brawling Brothers Christmas Bonanza. You must join through the link provided below. We are looking forward to an awesome season of Giving. Cheers to Bourbon, Boardgames, and Churros!! Alternatively, you are given the option to pick which countries you are willing to ship to. However I strongly encourage you to not limit yourself as shipping a gift to someone in another country can be a very rewarding experience. The distinctly international flavor of the Brawling Bros Christmas Bonanza is one of the best aspects of it, in my opinion, so don't limit your options! Thanks for organizing this Ryan! Looking forward to this one...thanks, Ryan! So i had an email about a 404 error code when clicking the link... is anyone else having the issue.. I logged out and clicked the link as a non guild member and it still worked fine for me. We currently have 10 people signed up... We would love to see 50 people participate. Thanks for organizing this Ryan! I'm in for the inaugural BB exchange. I hope to spread good cheer as the Brawling Brothers spread the laughter each episode. Excited to be involved!! Quick question, is it OK to send a slightly used game that's on the receivers wish list as long as I also send a new game upto the value of $50 USD thats on their wishlist? I have quite a few games I've only played once and would love to send one to a loving new home. I think if anyone is against receiving used games, they should mention it here. Everyone knows I'm a stickler about my stuffs - but I'm totally good receiving used games. I also think its a VERY good idea for all of the non-US'ers (Look Josh, I made a hyphenated word, thing!) To post links/contact info for FLGS and/or OLGS. In my experience shipping from the US to AUS, SWE, etc is very expensive and cuts down on the quality of gift that can be given. Good ideas Brandon. I am perfectly good with receiving used games. Otherwise, I have 3 very good FLGSs nearby. To answer your question, if you are sending a New game and just want to make Christmas more special by loading someone up and sending a used favorite game or one off their list as well.. thats your deal! No worries. So tempting... But between JVMF auction items and BGG Secret Santa, I'm already on the hook for two big boxes of gifts. I think I would end up in the North Pole if I signed up for another on, cause my wife would kick me out. I know the feeling.... hubby will kill me... but still some time to decide! Okay I'm in! Thanks for organizing this, Ryan. Regardless of your decisions, it's such a pleasure to see you both here in the guild, Landry & Mr. V! Thanks everyone for participating.. its going to be fun! Here's my list of links to online Games Stores in Sweden that can ship to me without costing you an arm and a leg in shipping. Problem is of course that they are in Swedish and you might have to let Chrome translate them (go Plugins!). We are up to 17 registered.... lets keep it up. Question: as I have absolutely no more room for new games, would it be ok to specify for this exchange to only get 'promos, accessories, expansions' for games I already own? Stuff that would fit in the boxes I already have, I mean? Or would that not be in the spirit of the season? That's the tricky bit, especially when it comes to promos and accessories. I started adding promos but it clutters up my wishlist a lot, making it look like games that have a lot of promos are may favorite. While some of my fav games never had a promo made. And when it comes to things like Broken Token dividers or card holders and such, they usually do not have an entry. I do have a concern - we will be travelling so will not be home. So I was wondering is it possible to request the gift is to be hold off until a specific date to ensure that I will be home to receive it? We will be flying out on December 25th so theoretically it should arrive on time but things do get delayed and such.